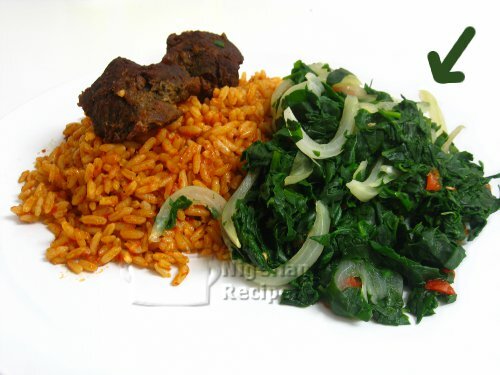 In Nigeria, we steam leafy green vegetables and serve it with most Nigerian Rice recipes: Jollof Rice, Coconut Rice, Rice & Beans, Concoction Rice, White Rice & Stew (including Ofe Akwu). These steamed vegetables are also great with Fried Plantains and Nigerian Moi Moi. You only need these 4 ingredients. You do not need salt for this recipe. The steamed veggies garnish is well seasoned by the Knorr cube. Wash and slice the vegetables, onion and pepper. Set a clean dry pot on the stove and set the heat to medium. Add the sliced onion and pepper. Crush and spread the Knorr cube on the onion and pepper. Cover the pot and steam for 3 minutes. This is so that the vegetables are not overcooked. Stir very well and it is done. Serve with Jollof Rice, Coconut Rice, Rice & Beans, Concoction Rice, Fried Plantain or Nigerian Moi Moi.